I have been getting a lot of compliments on my blog and in my latest YouTube video where I was rocking a red lip, which you can see the blog post here! I made it my goal this fall to get out of my lip comfort zone, and I think a great way to do that is to try some daring but cheap makeup items. I’ve really wanted to try a red lip but I don’t want to spend a fortune trying out something new. If I don’t like how red looks on me, I don’t want to be $20 poorer. That is yet another reason why I love Wet ‘n Wild. If you want to try out a bright lime green eye liner, pick up one for 99 cents! If you’re thinking of experimenting for red eye shadow but are scared that it might make you look sick, then try out a Wet ‘n Wild shadow or palette with red in it! You can’t go wrong when sometime costs you less than a dollar, which is how much this lipstick set me back! Keep reading for swatches and my thoughts! First thing to mention is the color. This is your standard true red. On my hand it leans a little bit to a blue red, but I think on its own on my lips it looks a little more like a pink red. The finish seems like a satin finish. I was looking for a matte finish, but I kind of like the slick look that it gives. I definitely don’t need to wear a gloss with this because its shiny enough. 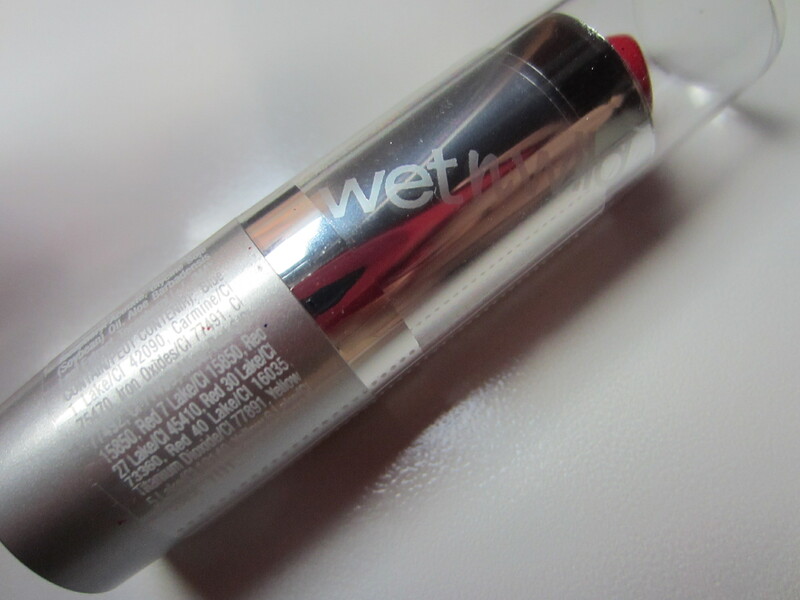 Wet ‘n Wild refers to this as a silk finish, as the name of the line would suggest. Since I’m still a newbie to the world of lipstick, if this strikes you as a different finish then please let me know what it is in the comments below! The formula on this lip stick is a little slick. I slides around my lips a little so if you want to keep this on your lips and not on your cheeks or teeth, then I suggest pairing it with a lip liner. What I like: The price! Its less than a dollar! Totally worth it for a novice looking to try out something new! Also, it feels really nice on the lips. It feels almost hydrating! 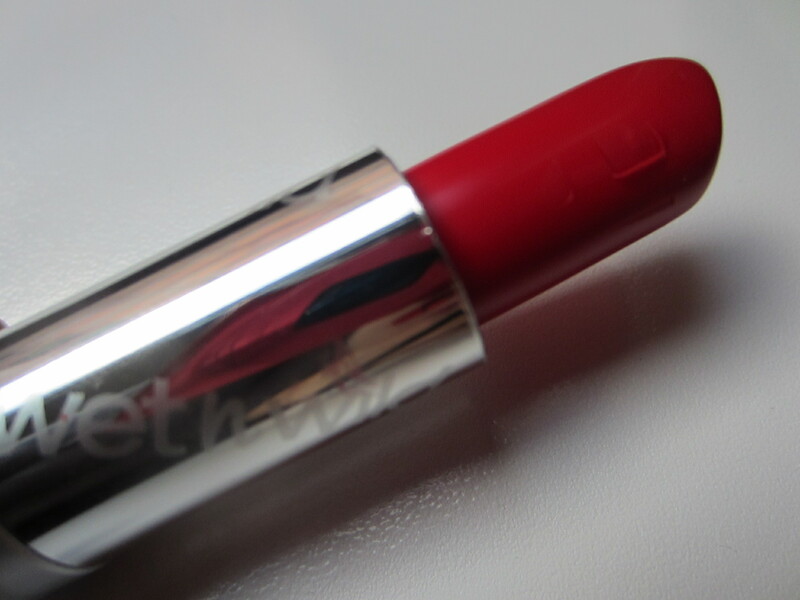 It’s also a buildable coverage lipstick. 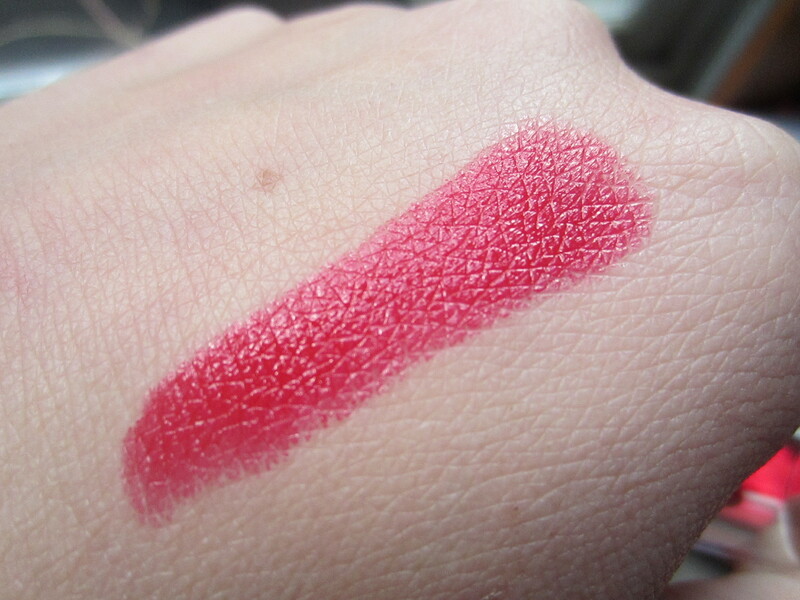 The swatch on my hand is going over it 4 or 5 times while the swatch on my lips is just going over it 1 to 2 times (quick swipe back and forth across my lips). So it can be versatile, either worn opaque or for a light wash of color. What I don’t like: It slides around a little, but not so bad that I would deter people from buying it. I definitely have to wear a liner when I wear this because the first time I tried this out it migrated to the outer edges of my mouth. Although I like the fact that its buildable, on the first swipe it is a little sheer, so if you’re looking for a pigmented lipstick you might be better trying the Megalast line. Overall, I do recommend it for the price! Its really nice, but not perfect. I have tried better, even in my limited experience. But I like that I can wear a light wash of color or a bold red lip. For less than a dollar, its definitely something to try out! But if you’re a lip connoisseur, then you might be a little disappointed. ← HUGE Nail Polish Haul!! Such a pretty shade on you and I love that you are experimenting outside your comfort zone! I like it on you. It looks pretty subtle. 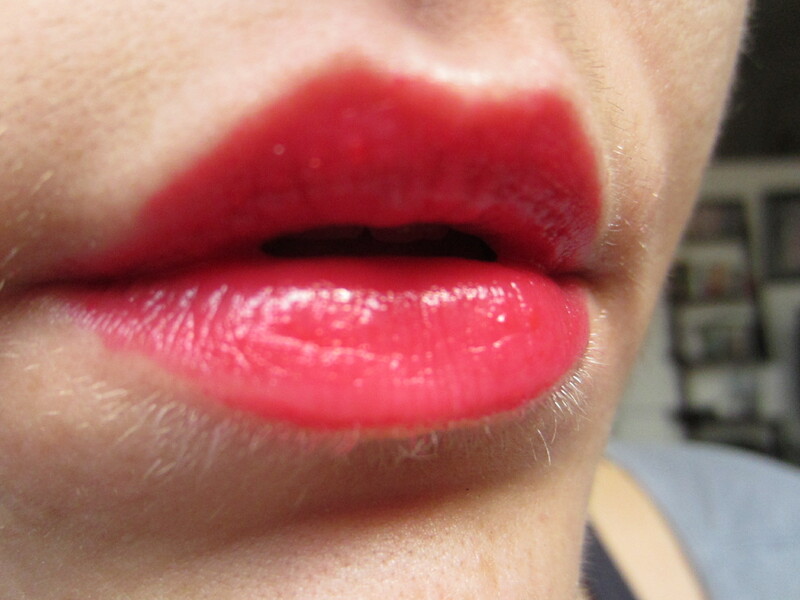 I’m always looking for subtle reds for when I’m not wearing full-on pigmented red-reds.